Do they offer enough bang for £4,000? Bang & Olufsen is known for doing things differently, for example, to celebrate its 90th Anniversary the companycreated a massive £54,000 speaker, and instead of immediately jumping on the latest technology-laden bandwagon, they'll wait untiltechcan deliver the premium sound quality they're known for. The company's legendary speaker, the BeoLab 8000 was on sale unchanged for 18 years. That's almost unheard of in the tech industry, Apple would have churned out 18 iPhones in that time! We got our hands on thenew BeoLab 18 speakerstasked with replacing the legendary 8000s. Are they up to the job? The BeoLab 18 speakers have a love it or hate it design, personally, I love them, others in the office aren't so keen. They look like cathedral organs, and really act as a statement piece in your room. They're clearly an homage to the original BeoLab 8000 speakers, with the fluted aluminium stand, chunky base, and fanned outgrill. But the new design is much more elegant, and the fabric grill has been replaced by 19 wooden 'lamellas'. These come in black asstandard,but are also available in white, oak, maple, and walnut (for a cost). The top is adorned by asculpturedtweeter, which illuminates green when you turn the speaker on (and red when there's no connection). As we've said, these speakers are statement pieces, at 132.4 cm tall, 15.5 cm wide, and 11.5 cm deep they're not going to be hidden anywhere. They're also quite weighty at 8.5 kg (although, most of that is the extremely solid base). There are no physical controls on the external casing of the speaker, but hidden behind the lamellas are a few switches which relate to speaker placement (left and right, as well as corner, wall mounted, or free position). The power cable slots in at the rear of the speaker (again, behind the lamellas), and as they're wireless, this is the only wire that trails out of them, keeping things somewhat sleek. 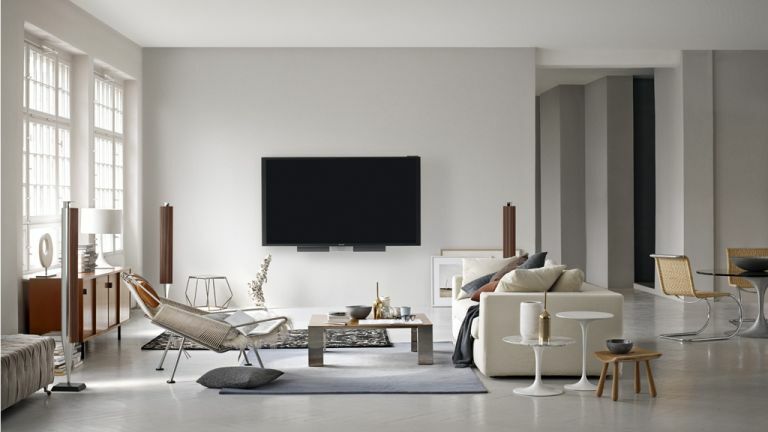 This has two benefits, firstly WiSA-certified speakers are compatible with one another, which means you could buy devices from another manufacturer and have it work seamlessly with your existing Bang & Olufsen setup. Secondly the specs include transmission of 24-bit, uncompressed audio at sampling rates of 32, 44.1, 48 and 96 kilohertz, with a speaker-to-speaker delay of 160 nanoseconds. In more simple terms, it should sound great. Hidden behind the lamellas are two 160-watt amps which drive just two 4-inch midrange/woofers. At the top there's a single 0.75-inch dome tweeter, with a beautiful acoustic lens for wide high-frequency dispersion. The lamellas also aid in sound dispersion of the mid-range frequencies. The overall result of these speakers is that they sound great, they're incredibly loud, with very little distortion. There's a perfect amount of bass (for my taste), yet the treble and mids remain clear. Essentially, they sound exactly like how you expect expensive speakers to sound. Now onto the cost, a pair of these bad boys will set you back around £4,000. That's a lot of money. Of course, that's just for the speakers, you're also going to need a receiver, otherwise you'll just have two speakers and no way of playing music on them. We played all of our test audio through the BeoSound Essence. Which is essentially a more expensive Google Chromecast Audio. It's a sleek device. There are four buttons, and a smooth rotating the bezel to adjust volume. It's much nicer to control the speakers using this than the from the Bang & Olufsen smartphone app. They'd also perfectly compliment your BeoVision Avant 85. These speakers are pricey, so you'll need deep pockets, and they're large, so you'll need a lot of space. But if you're after stunning looking speakers that also sound great, these should definitely be taken into consideration.